This recipe works great as a snack or for a quick breakfast, especially if you’ve made it ahead of time. We like to put it in a bowl and add dried fruit and milk or cream. 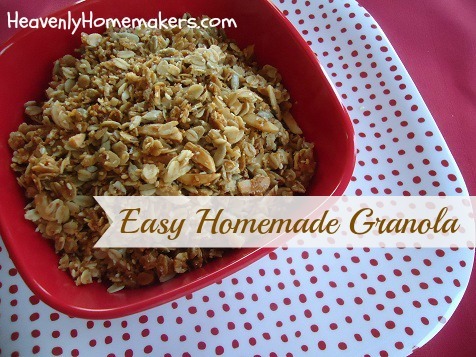 A friend of mine even adds applesauce to this granola for a sort of “apple crisp” taste. Her kids love it that way! In a small sauce pan, melt together coconut oil and honey. Stir all remaining ingredients together in a large bowl. Drizzle on the honey/coconut oil mixture and stir well. Pour mixture onto a large, parchment paper lined baking sheet. Bake at 300° for 35 minutes, stirring after the first 20 minutes. Store granola in an air tight container. Are you granola eaters at your house? Yum! I love granola, perfect with yogurt and fruit. Thank you Laura. I love this recipe, just as much as I did the others I tried so far. I started making it a few months ago. Love to store some in the fridge and throw it on top of a smoothie – the kids love it too!!! This is so funny because one of our favorite breakfast is granola with fruit and yogurt. I have been avoiding it because I never liked the soaked version. You have given me the green light to start back. My recipe is so easy as well. I sub out maple syrup for the honey and it’s yummy too. The soaking issue should not be a burden and now if I dont soak something.. I will not feel guilty! One granola making tip: I’ve found the Pyrex 9×13 pans easier to bake it in than on cookie sheets – especially when you’re trying to stir it without having it go over the edge. Also, it doesn’t tend to burn as easily in the glass pans as it does on metal. My recipe is almost the same as yours, but I like a honey/sucanat combination and lots of cinnamon added! My kids love homemade granola and I make it different every time. My son has a nut allergy so I use sunflower and pumpkin seeds for crunch and I add ground flax seeds. I got tired of buying over priced processed sugar cereal that my kids would eat a box in one sitting. So now That is all I make and I no longer buy bagged or box cereal. It’s just one of my steps to healthier eating. And I made those Simple soaked pancakes and my Hubby said it tasted like dough so I think soaked grains are out for me. Love the new dishes! Red dishes are my favorite! I frequently buy a pretty plate at a yard sale or thrift store for a quarter or fifty cents just for serving or to put a cake on. I have a stack of them in my cupboard. Granola with homemade yogurt is one of our favorite breakfasts! :-) And I love your new dishes – polka dots are great! Laura, we are huge granola eaters. I make a double batch (14 cups) every week. My tip is to microwave the wet ingredients for 1.5 to 2 minutes and bake while you’re baking something else. I leave it in overnight or all day to keep baking and use less electricity. I’ll have to try yours with the coconut oil, I’ve never used. Here’s my link: http://momonamission.me/?p=286, thanks for sharing. I’m the sole granola-eater in my house – my husband says granola is “too crunchy.” What does that even mean?? I make all different kinds, but am still on the hunt for the perfect recipe, so I look forward to trying yours! We just made Breakfast Banana Splits with granola today. I use the granola recipe from Green Smoothie Girl. My guys are little so I served a half of a banana split lengthwise, topped with homemade whipped cream (or you could use yogurt), topped with homemade granola, topped with Enjoy Life mini chips, and a sprinkling of blueberries. It was served with a side of toast (from homemade whole wheat bread). We loved it! Depending on the flavor and texture of your granola, it can also be a substitute topping as the top crumb crust on a pie or cobbler. I have a recipe I use all the time. It is so good for you. I also know that even if I use sugar, it would be much better for us than cheerios or whatever else I happen to get on sale! Looks YUMMY! Where’s the milk or yogurt? :) I just made some granola this morning.Tried a new recipe that looked like a promising “chunky” granola, which is my favorite…I could eat it all day:) Made a few adjustments, and I think I’ll do a few things different next time too. Nummy! I just made this and now I’m eating it for lunch with frozen blueberries and milk. I left out the sesame seeds, and instead added a handful more almonds and a sprinkling of flax seeds. I also added a couple T. of cinnamon. I started it out in a 9×13 pan, but then transferred it over to a baking sheet halfway through the cooking time. I also baked mine for 10 more minutes (45 total). It still is pretty oily, so next time I might try a tad less oil (and maybe even a smidge less honey). Thanks for a wonderful recipe! I’m always trying new granola recipes and this one is my new favorite!!! Yeah!!! Just in time! I was going to buy some from the store but it was kinda pricey. Now I can make this and it’s so much healthier!!! We love homemade too and use much of what you do with lots of nuts and seeds and things thrown in. The coconut oil creates great flavor and crunch too. I am not sure if anyone else commented about this but I cook mine for 10 min at 375 and then turn off oven and leave the granola in overnight – in the morning it is cooked to perfection and the house smells Wonderful and cinnamony! Got that from another blog years ago – I think it was called “Crystals Lazy Granola”. YES! I love granola and try to always have it on hand for a hearty breakfast. You can also substitute some of the oats with flaked wheat–YUM! (If you’re flaking yourself, though, be sure to use soft wheat. Hard wheat won’t flake, it will just break into pieces.) I love trying different granola recipes. Thanks Laura!!! Hey…you’re linked to Apartment Therapy! For your suggestion of cooking pasta in milk!! Hmm, not sure what you mean. Can you point me the the post you’re refering to? Thanks! Super yummy recipe. I like to add in peanut butter. Peanut butter granola is soooo addictive. My fiancee is HIGHLY allergic to coconut. What kind of oil would you recommend using in that situation? For now it’s fine but once we’re married this will no longer be an option. This may sound funny,as the main ingredient in granola is oatmeal, but I hate oatmeal. I love granola! (It is crunchy, not soggy and doesn’t stick to the pan or bowl!) What can I use in place of the cocoanut-it isn’t a favorite of mine, since I got sick on it when I was 4. I really want to try this one, because I have most of the ingredients and will be adding some freeze dried fruits to it and maybe some freeze dried yogurt when it has dried out. palm oil or olive oil. I made this today and it turned out great. I used half melted butter & half applesauce to cut down on cost & fat. Yummy in some yoghurt. Laura, I had a question about whole wheat flour in your recipes. Can I use whole wheat pastry flour instead of whole wheat flour? It depends. Whole wheat pastry flour works great in muffin, cookie, cake and pastry recipes. But it does not work well in yeast bread recipes. If I wanted to soak my oats before I make this what ratio do you suggest? 4 cups oats to soak in 1 cup yogurt/keifer/buttermilk and 1 cup water? Hmm, with this recipe, I really don’tt hink soaking the oats would work at all. Unless you have a way to dehydrate them afterward maybe? Probably a dumb question but how long can this be stored? Thanks! It is AMAZING! I had to put it in the jars as soon as it cooled and store it away so I wouldn’t keep eating!!!!! An update – after it cooled, it got crunchy! Probably too much so – although it isn’t “burned” per se. So next time I’ll try just 45 min, and see how it goes. My family hasn’t had a chance to try it yet, but I can’t imagine they won’t like it. I wished I had enough to make a double batch, because I can imagine this will be gone in 2 sittings with my family of 5. But maybe 3 sittings. Hopefully! Yummy! I just put a double batch in the oven. I didn’t have sunflower seeds, but I added some chia seeds and dried cranberries. It is going to be so delicious! Thanks for the easy recipe! Thank you for sharing! This looks easy to prep, Ill have this for breakfast with my kefir drink. This would pair perfectly with kefir! Yum!